The new RCT1000 Badger Meter Coriolis flow meter. RCT1000 meters are especially suited to the precise measurement of high viscosity fluids, aggressive media and contaminated fluids as well as high density gases, whilst maintaining a wide turndown ratio. 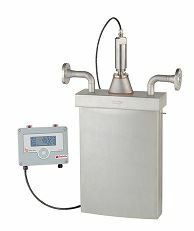 Typical applications for these mass flow meters will include filling or dosing oils, solvents and chemicals and measuring adhesives or binding materials, coatings and hardeners, dyes, vitamins and other additives. Coriolis flow meters are true multi-variable instruments, which means that they provide simultaneous measurement of mass flow, density, temperature and volume flow. A feature of this design is the lack of internal moving parts, enabling the flow meter to experience little or no mechanical wear, resulting in a long operational life expectancy. The RCT1000 can control equipment, such as valves and pumps with PID and batch control signals. The transmitter features a user-lock feature to prevent accidental activation as well as a local LCD display with optical buttons which allow the operator to navigate the display through the glass without opening the enclosure.